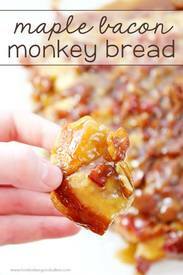 Oh my gosh - this Maple Bacon Monkey Bread is AMAZING!!! It makes a great addition to a weekend breakfast! Y'all, this stuff is insane!! My boys devoured the entire pan of this Maple Bacon Monkey Bread without even batting an eye - it's a good thing they at least let me get pictures before they inhaled it! Of course, when you combine maple syrup, Bacon, pecans - you know it's going to be good! Lawd have mercy, just look at all those biscuit pieces drenched in maple syrup and covered in Bacon and pecans!! Swoon!! I did get to taste a corner piece before it disappeared and I can't wait to make this again!! As it was baking my kiddos were coming into the kitchen like vultures wanting to know what I was baking - so be warned, it won't last long!